Modern healthcare has applied the scientific method to produce life transforming interventions. There is now an expectation that this same scientific rigour will lead to care being implemented as safely and reliably as possible. The serious burden of avoidable adverse outcomes and associated patient dissatisfaction has led to calls for all in healthcare to embrace the quality improvement agenda. Healthcare professionals are being urged to maximise the quality of care provided to their patients by reducing the unwanted variation in the delivery of therapeutic or preventative regimes that their patients receive. Increasing the reliability and safety of healthcare delivery maximises the chances of optimum patient outcomes and reduces the risk to all healthcare professionals of complaints, claims or regulatory body censure. 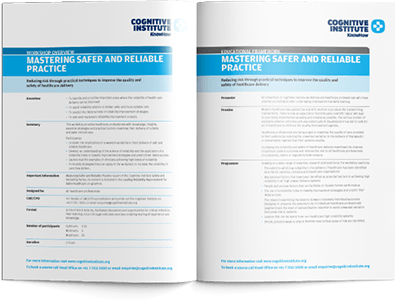 The Mastering Safer and Reliable Practice workshop provides healthcare professionals with knowledge, insights, essential strategies and practical tools to maximise their delivery of reliable and safer clinical care. simple, practical ways to ensure that the most critical areas of risk are identified. Workshop participants will examine a number of approaches and devices developed by the Cognitive Institute to assist them implement the science of reliability. 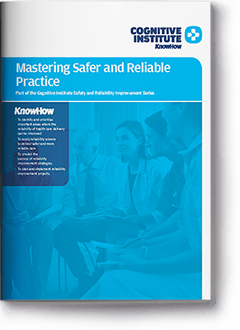 These tools assist participants to identify areas of significant risk, engage with colleagues to improve reliability and examine and redesign processes essential to the delivery of high reliability. A mix of short lectures, facilitated discussions and opportunities for critical reflection. Peer learning occurs through reflective exercises enabling sharing of experience and knowledge. The Mastering Safer and Reliable Practice workshop is ideal for all healthcare professionals. formulate strategies, plan and implement reliability improvement projects that can be applied to increase the reliability of care delivered. Reducing risk through practical techniques to improve the quality and safety of healthcare delivery.